Gjelina barely needs introducing to most of our customers. But for those of you who have never eaten at this Abbot Kinney restaurant, it is one Los Angeles’s most talked-about restaurants, lauded by critics from London to New York to San Francisco and beloved by stars, locals, and out-of-towners alike for its seductive simplicity and eclectic Cal-Med menu from talented chef Travis Lett. 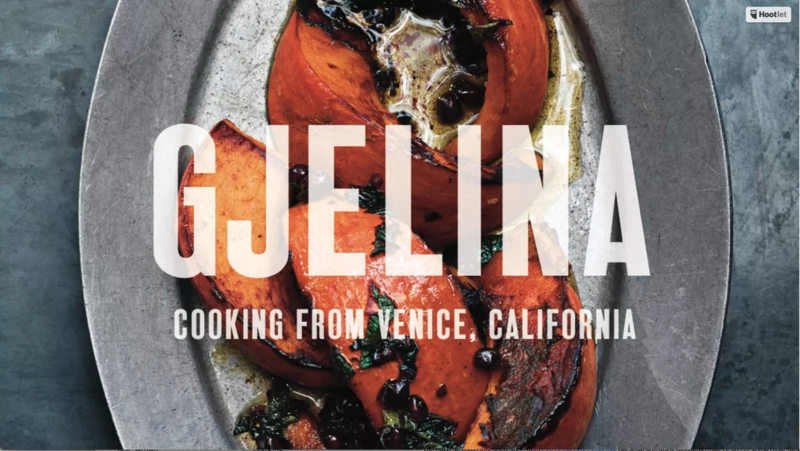 Our next mealplan features ingredients and recipes from the best-selling cookbook of the same name, Gjelina, by Travis Lett, so you can prep a rustic and utterly delicious salad, a pizza made with a ball of pizza dough straight from Gjelina’s kitchen, pan roasted vegetable dishes, meat mains, and more. Check out the mealplan here. Included in the Large Real Food Box: pizza dough from Gjelina so you can easily make your own amazing pizza; CA Medjool dates, brussel sprouts and bacon to re-create the restaurant’s best-selling Charred Brussel Sprouts with Bacon; Feta cheese for the Bloomsdale Spinach Salad; and sweet Japanese Baby Turnips and Thumbelina Carrots to pan roast and dress with a spiced yogurt sauce. Last but not least, Jimenez lamb ribs slow-cooked with a Guajillo-glaze. The Produce-only Boxes feature Thumbelina Carrots and Japanese Turnips, Brussel Sprouts, Bloomsdale Spinach, Avocados, and Cherry Tomatoes. • Omnivore 5-meal Real Food Box includes ingredients for all the recipes, plus additional staples and fruit. • Vegetarian 5-meal Real Food Box includes ingredients for the Bloomsdale Spinach Salad with Honey-Garlic Dressing and Pan Roasted Baby Turnips with their Greens & Chimichurri, with Pan Roasted Baby Carrots, Orange, Cilantro, Sesame & Spiced Yogurt, plus ingredients for 2-3 more meals of your own invention, plus additional staples and fruit. Photographs copyright @ 2015 by Michael Graydon and Nikole Herriott.